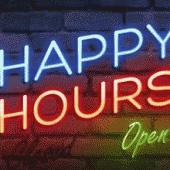 From now until September 9th, Unibet is running four happy hours per day. Simply grind during these times to boost your Loyalty Points. 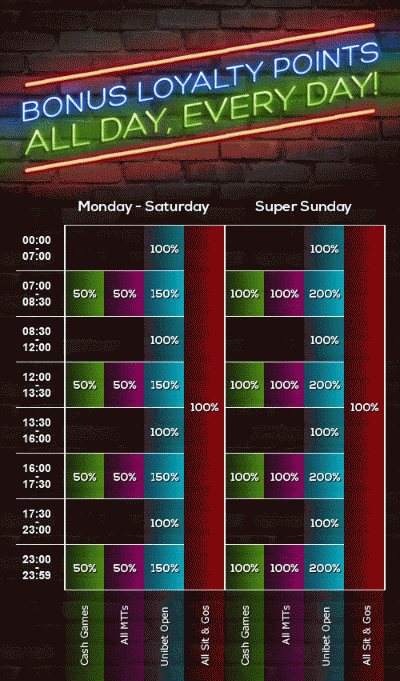 Players can earn their extra happy hour Loyaly Points in cash games, multi-table tournaments, Sit & Gos or Unibet Open satellites. How many more Loyalty Points will I earn? From Monday to Saturday, cash game and MTT grinders earn 50% extra bonus Loyalty Points during each happy hour. On Sundays, that’s bumped up to 100%. Sit & Go players have cause to celebrate – the 100% multiplier applies every day. Satellite specialists playing Unibet Open qualifiers get an even better deal – 150% extra from Monday to Saturday, and 200% more on Sundays! Bonus Loyalty Points can be used to buy into tournaments or purchase items from the Unibet Shop. Open a Unibet account today and receive up to 30% rakeback and a sign-up bonus of up to €1,000.